3 Scriptures to Pray Over Your Kids (And Grandkids). Whether they are toddlers, teens, or adults, your kids need prayer. You may not have kids, but you might have nieces or nephews, or friends’ kids who desperately need prayer. Or you might have “spiritual children” that you have mentored. Are you willing to take time to cover them in prayer? One of the best practices you can cultivate in your prayer life is the power of praying Scripture. When you pray God’s Word over those you love, you have an instant guarantee that you are praying in God’s will. As you faithfully claim Scripture over the lives of those you love, you’re going to see God work miracles. To help you get started in this practice, I’ve chosen three passages that I love to pray over my kids and grandkids. I know you’ll have more ideas, so I’d love to hear from you! Leave a comment and give me your favorite verse to pray over your kids or someone else’s kids, and I’m going to choose 3 comments and give away 3 copies of The 30 Day Praise Challenge for Parents. 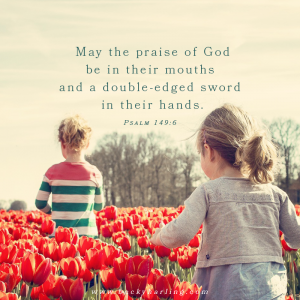 Psalm 149:6 – “May the praise of God be in their mouths and a double-edged sword in their hands.” I love to put my kids’ and grandkids’ names in this verse and ask God that His praise will be in their mouths always and that they will learn to use the Word of God – the double-edged sword – to defeat the enemy. Satan wants to discourage and defeat the work of God in our kids lives—I pray that they will use the two most powerful weapons to defeat him: praise and Scripture. Joshua 1:9 – “Have I not commanded you, Be strong and courageous. Do not be afraid; do not be discouraged, for the Lord your God will be with you wherever you go.” With graduations right around the corner, this is a great verse to pray for those you love. The world is a scary place, and to follow Jesus takes courage. We need a generation of courageous Jesus followers who are willing to take up the cause of Christ regardless of the opposition they face. Ephesians 3:17b-21 – “And I pray that you, being rooted and established in love, may have power, together with all Lord’s holy people, to grasp how wide and long and high and deep is the love of Christ, and to know this love that surpasses knowledge – that you may be filled to the measure of all the fullness of God. Now to him who is able to do immeasurably more than all we ask or imagine, according to his power that is at work within us, to him be glory in the church and in Christ Jesus throughout all generations for ever and ever! Amen.” Kids and adults alike need to be deeply rooted in the love of Christ. I pray that my kids, their spouses, and my grandkids will know categorically how deeply Christ loves them; I pary that their identity will sink down so deeply into the love of Christ that no matter what comes their way, they’ll be able to stand firm in their value as one who is deeply and unconditionally loved by Christ! I am home for the next week resting and writing! On May 19, I will leave for England to join Steve and our international leaders. Thank you for praying for me over the last few weeks. All the video teaching is completed for Who Do You Say That I Am? The videos will are now being edited, and I’m developing a Listener’s Guide. I’m super excited that these videos will be available to churches and home groups on August 7! Several Spanish publishers have been contacted to possibly translate, Who Do You Say That I Am? into Spanish. Please pray for favor! You have won a copy of The 30 Day Praise Challenge For Parents. Could you please email me becky@beckyharling.com our mailing address?